The 4-star contemporary hotel, rooms and suites feature WiFi access, flat-screens and walk-in showers. Seneca Niagara offers 604 deluxe rooms and suites, providing easy access to those who dream of hitting a life-changing jackpot and feeling the mists of Bridal Veil Falls, all in one incredible getaway. Guest you will enjoy distinctive amenities and luxurious touches designed to elevate your stay. While you’re here, take a dip in sparkling indoor pool or keep up with your routine in our modern workout facility. There are several restaurants, ranging from a casual cafe to The Western Door Steakhouse, plus a nightclub and live entertainment. 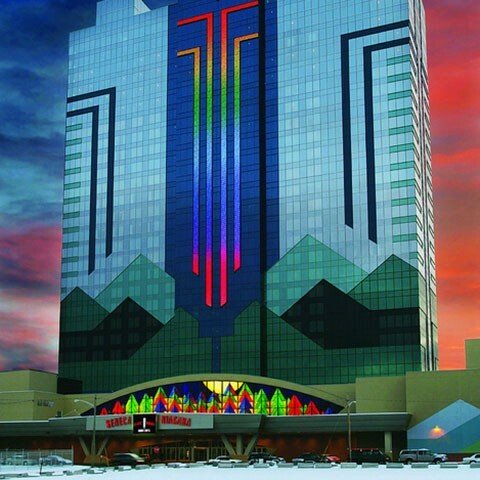 Seneca Niagara offers endless ways to win with the most sought after slots, tables, keno and poker games in New York. Feel the anticipation, experience the thrill, and claim your fortune at Seneca Niagara Resort & Casino. The gaming floor offers some 4000 slot machines as well as table games, roulette, a poker room and a keno lounge.